Borneo’s baby-faced pygmy elephants are increasingly pitted against humans, in sometimes-fatal confrontations, due to the depletion of their habitat and fragmentation of their migratory path. But if the wildlife and forestry authorities, oil palm plantations and tour operators see the creatures’ conservation as a common cause, they might just have a chance of survival. They were dying, or dead, by the time the rangers got to them. In the span of a few weeks, 14 endangered pygmy elephants endemic to Borneo—a distinct, smaller sub-species, with bigger ears and longer tails, of which about 1,500 are left in Sabah—were found in separate clusters in the Gunung Rara Forest Reserve near Tawau. In one group, they were upended—legs in the air, bodies draped haphazardly over one another as if felled without warning by a mysterious plague, which had left their bodies unmarked and outwardly robust—except for the blood seeping from their mouths. Amid all this, however, there was one lucky survivor: a lone male calf, just three months old and barely a metre tall at the time, who stood faithfully by his mother's side, nuzzling her still form with his trunk as if urging her to quit playing dead already and get up. She never did. Dr Rosa Sipangkui, a veterinarian at the Lok Kawi Wildlife Park in Kota Kinabalu, recalls the scene: “We were trying to get closer to his mum to take some samples from her, but he kept try- ing to push us away, just like a human—‘Don’t touch my mum. What are you trying to do to my mum?’” Fearing that the rest of the herd would abandon him to fend for himself—and likely, die— Lok Kawi took him under its care and gave him a name: Baby Joe, short for the area conceded to Empayar “Kejora” Sdn Bhd for logging by the state-owned Yayasan Sabah Group, 5km from where he was found. Now, eight months later, Joe is healthy, well-loved and reportedly very “man- ja” as a result—he enjoys making his carers run after him during mealtimes. Nevertheless, it’s a welcome change to the melancholy and antisocial behaviour he exhibited in the beginning when, as Sipangkui tells it, he seemed to relate better to his human carers than his fellow elephants; now, he happily plays with four-year-old Bikang, whose trunk was partially severed by a snare trap. Baby Joe might have taken a while to adjust, but to the world, he quickly became the poster boy for his species and its survival. 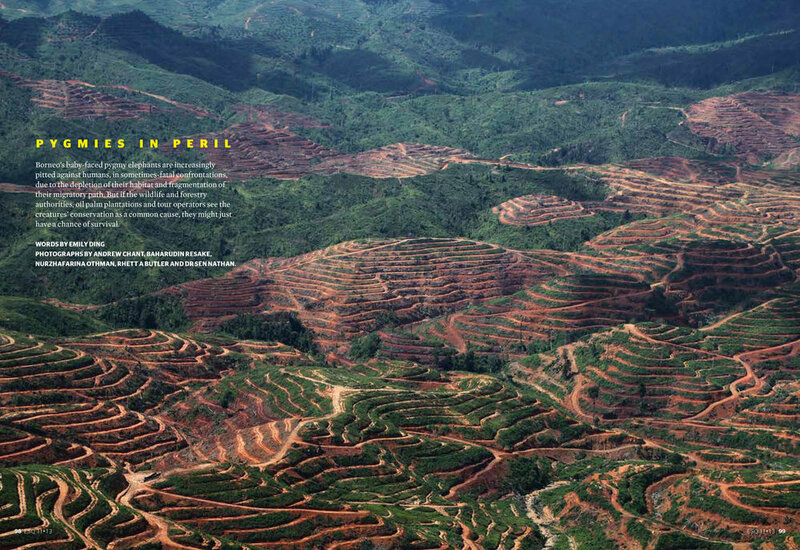 In the aftermath of the deaths, some international media and non-governmental organisations were quick to point the finger at oil palm plantations, which occupy 1.6 million hectares (20 percent) of Sabah’s total land area of 7.5 millionha, and are seen to encroach upon wildlife habitats (currently 980,000ha of protected forests and designated sanctuaries), which increases human-elephant conflict, in which the animals sometimes die due to gunshot wounds or poison, as is suspected in this case. However, Dr Sen Nathan, a vet and as- sistant director of the Sabah Wildlife Department (SWD)—which comes under the purview of the Ministry of Tourism, Culture and Environment— points out that the root of the problem dates back to large-scale logging in the ’50s, the consequenc- es of which only became apparent later when, according to Dr Nathan, the population grew by 300 percent from the ’70s to 2000 to the 3.4 mil- lion that it is today. The plantations, he says, came about as a consequence rather than a cause: un- sustainable logging had degraded the forests, and when they were no longer producing enough tim- ber to generate income for the state, they were converted to oil palm plantations. Sabah’s Forest- ry Director Datuk Sam Mannan had said, in an in- terview at theoilpalm.org (set up by the Malaysian Oil Palm Council seemingly to debunk what some see as the unfair demonisation of the industry by some western quarters), “Without oil palm, so many of our conservation efforts would not have been able to be financed,” citing the drop in log- ging revenue from 90 percent of Sabah’s income in the ’50s to just five percent today—palm oil being, effectively, the substitute. It’s not surprising, con- sidering it’s big business: palm oil is used in food products, detergents, cosmetics and, increasingly, biofuel; global production has also doubled in the past decade, and will likely do so again by 2020. In 2011, the sector was the fourth largest contributor to Malaysia’s economy, accounting for RM53 bil- lion of Gross National Income (GNI), with Sabah responsible for a third of national output. This has elevated the lives of Sabahans by directly employ- ing an estimated 200,000 workers and empower- ing small farmers. However, Dr Nathan adds: “I’m not denying that new areas have also been opened up for oil palm,” which directly drives deforestation. Ac- cording to SWD, Sabah has lost about 40 percent of its forest in the past 40 years. This has also led to forest fragmentation; in the Kinabatangan district, Dr Nathan says, “There are quite a num- ber of bottlenecks, and in some areas, no forest connectivity at all between the lots.” The SWD is leading efforts to open up a continuous “corri- dor” through which the elephants can travel, by re-acquiring land through the Borneo Conserva- tion Trust—though, as Dr Nathan jokes, to com- plete this could take up to 200 years due to the many stakeholders involved. In the meantime, elephants are forced to venture into surrounding oil palm plantations, threatening crops and revenue; and worse for small farmers—their livelihood. “If you’re a big plantation, and a group of elephants destroys 10ha of your 10,000ha, it’s just a small percent- age and you can buffer the loss. But not if you’re a small farmer,” Nathan says. Similarly, small farmers can’t afford to erect electric fences or pay for the SWD’s Wildlife Rescue Unit (WRU) to translocate elephants, and are more likely to take matters into their own hands. Last month, an elephant was found shot at close range in Batu Putih, on the border of a forest reserve and a small plantation. According to Dr Nathan, about 15 to 20 pygmy elephants die in Sabah every year—from natu- ral means, gunshot wounds and being caught by snare traps meant for other animals. Despite this, Jimli Perigin, the SWD officer-in-charge of the Kinabatangan district, says that the number of elephants—at least in this particular area—is on the rise, because they are being thrown together in increased proximity, raising their chances of mating. “Ten years ago, we probably had around 150 elephants, but now, we have more than 250 elephants,” Dr Nathan confirms. But it also reinforces the problem—the lack of habitable space— and increases the elephants’ contact with human activity. Once, a group of elephants dug up a Mus- lim graveyard, before they were shot (though not killed). “They were probably looking for some minerals—calcium. They were eating the earth that was mixed with the bones,” Dr Nathan says. Both plantations had installed electric fences, but the estate’s general manager says, “These el- ephants are smart, and would uproot a tree and throw it over the fence to crush it.” Other planta- tion owners also say that the elephants grow im- mune to attempts to scare them off: noisy bamboo canons and bulldozers might work at first, but not for long. Translocations carried out by the WRU don’t really help as well; by several accounts, the elephants find their way back. Nurzhafarina Oth- man, who is doing her PhD research in the Kina- batangan area, put this down to their long-term memory: “The information from one generation is passed to another. That’s why they still keep to the same home range, even when the matriarch dies.” Translocating the elephants also isn’t cheap, and it’s up to the plantation to bear the cost. In the short term, it appears there isn’t much that can be done, but some longer-term measures have been put in place since the 14 elephant casualties. Earlier in June, 63,769ha of land was reclassified as Class 1 forest reserves for environmental pro- tection and biodiversity conservation, thus are protected from any form of land conversion or timber exploitation. Pygmy elephants have also been upgraded to fully-protected status, which means that anyone caught killing or hunting them will be punished with up to five years in jail and/ or up to a RM50,000 fine. Until then, it was tech- nically legal to hunt elephants—“but, of course, we never issued any such licence,” Nathan says. It’s still early days since the amendment, and no one has been prosecuted for hunting or kill- ing an elephant; but if the case of the 14 deaths is anything to go by, enforcement might be tricky. There’s a lot of pressure, Dr Nathan admits, for blame to be assigned, but eight months later the diagnosis remains much the same. 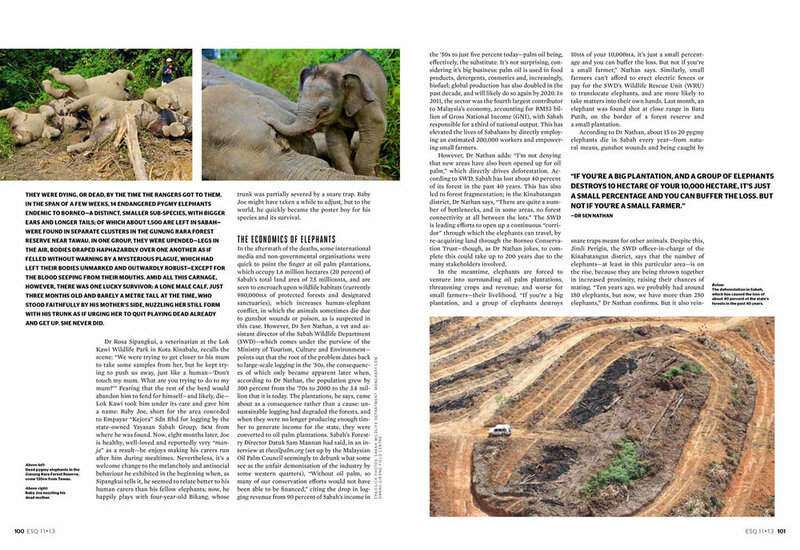 “We have suf- ficient proof it’s poison,” he says—from the severe ulceration and bleeding in the elephants’ diges- tive tracts, which he personally believes was de- liberate, as the chemical compounds found in the samples do not conform to the pesticides nor- mally used in plantations (no one has been found guilty). The suggestion among some local and international non-governmental organisations that the SWD isn’t doing enough, despite the on-going police investigation, rankles. But, Dr Nathan says, “You have no witnesses, you have no direct evidence. It’s difficult to prosecute and convict.” A reward of RM120,000 is also being offered to anone who comes forward with evidence, but so far, there have been no leads. Although elephants are the bane of plantations, they are a boon to tourism, the demands of which can also cause conflict with wildlife. Gert Van Opstal, who co-runs The Last Frontier Resort in Sukau, says it can be a problem when tourists feel entitled to an elephant sighting. “They’ll egg the guides on, who often don’t have the authority to say no. And they want tips, right?” In 2011, an Australian tourist was gored to death by an elephant when she came too close, though human casualties are rare. To monitor such situations, the resort has cooperated with other tour operators under an organisation called KiTA to champion sustainable tourism—each operator contributes RM10 for every customer they get, which goes into a central fund that is used, for example, to pay for the cost of a river patrol team. 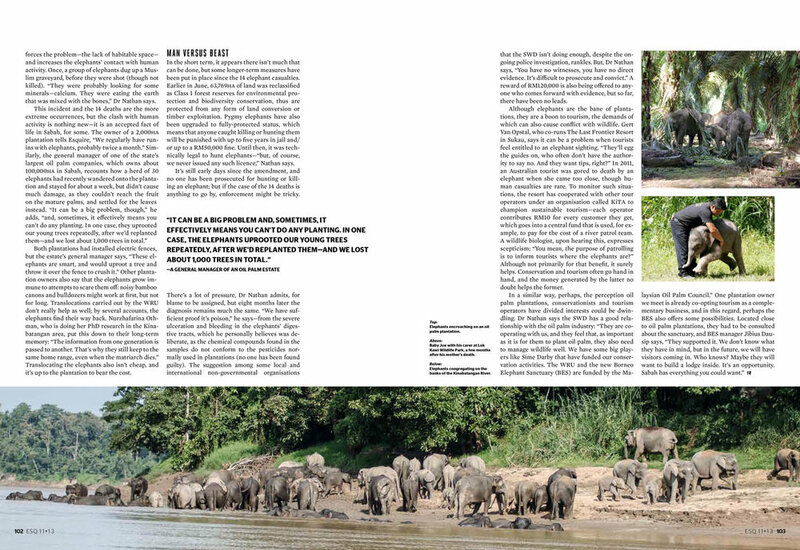 A wildlife biologist, upon hearing this, expresses scepticism: “You mean, the purpose of patrolling is to inform tourists where the elephants are?” Although not primarily for that benefit, it surely helps. Conservation and tourism often go hand in hand, and the money generated by the latter no doubt helps the former.